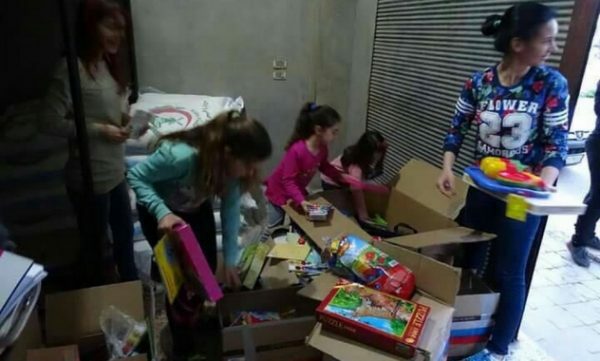 Moscow, April 26, Interfax - Residents of Maharda, one of the largest Christian cities in Syria, received humanitarian help and presents from Russia for Easter. 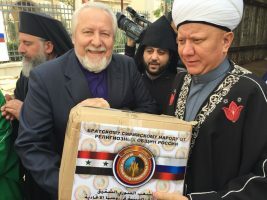 Over 3.5 tons of aid including medicines, food stuffs, school stationary and toys, as well as Easter cakes have been brought to Maharda at the request of the Russian Orthodox Church by representatives Boyevoye Bratstvo, a public organization of veterans, under the auspices of the Russian Center for Reconciling the Warring Parties in Syria, communication service of the Synodal Department for External Church Relations reports on Tuesday. The aid has been distributed to the needy at the charity center of the church of the Most Holy Mother of God. Maharda, one of the largest Christian cities in Syria and the native city of Patriarch Ignatius IV of Antioch. There are some 23 thousand people living in the city, predominantly Orthodox believers. The city, located in the Hama Province, quite recently has been besieged by militants. At present, battles are being fought in its suburbs. Maharda is being defended by local Christian volunteers. On the day when the Easter gifts from Russia were delivered, over 50 missiles fell on the city.